Sports Commissioner urges youth to prioritise education – Royal Times of Nigeria. 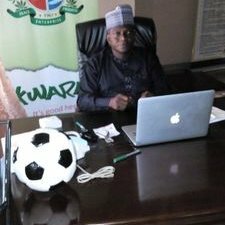 The Commissioner for Sports and Youth Development in Kwara state, Pharmacist Kale Ayo has called for youth in the state to place emphasis on education stressing that, for a footballer to be successful in life he or she must be able to successfully combine education and Football. Ayo was speaking at the Kwara Football Academy, KFA, yesterday as two players, William Oni and Maji Suleiman from the academy were given full scholarship because of their outstanding performances at the just conclude NPFL/LALIGA UNDER-FIFTEEN PROMISES TOURNEY. Speaking with Royal FM sports correspondent, one of the parents of the players, Mr Oni said he had called the academy two weeks ago to ask for more time before he could pay the school fees of his son, Williams Oni and so is shocked and ecstatic with this gesture from the management of the school. Mr Oni who described the KFA as a school for the entire nation thanked the management for this good deed and hopes the school gets the necessary fund to grow. Oni and Suleiman were part of the victorious ABS TEAM at the just concluded NPFL/LA LIGA PROMISES TOURNEY and will represent Nigeria in Spain.